8 April 2010, at 9:23a.m. 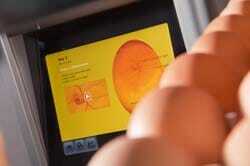 NETHERLANDS - Pas Reform will unveil SmartPro for the first time at VIV Europe 2010 in Utrecht. After three years of intensive research and development, Pas Reform is introducing SmartProTM – its latest and most advanced development for modular, single-stage incubation to date: a solution that enables Circadian IncubationTM. The modern hatchery manager's goal is to produce large numbers of uniform, robust day old chicks. Robustness is a health criterion, originating in the embryonic life stage of the chicken – and correlating directly with the performance and resistance of individual chicks under differing farm conditions. Detailed research has shown that robustness can be achieved by stimulating the embryo with a specific trigger, i.e. stimulation by heat or cold, during critical periods of the incubation process. This causes so-called 'embryonic imprinting' on a physiological level, to produce a chicken that will thrive in its farm environment. Such daily short-term thermo-conditioning is at the heart of Circadian Incubation – and known to improve hatchability, for long-lasting effects that include a one- to two per cent increase in final body weight and one to two points better feed conversion rates. Batches of uniform, robust day-old chicks also deliver uniformity at slaughter age, thereby improving processing yields, efficiency and performance throughout the entire production chain. To support the use of Circadian incubation, the incubator must deliver precise climate control. To achieve truly homogeneous temperature distribution, the challenge is to exchange energy, CO2/O2 and moisture – without affecting temperature uniformity around the eggs. Modular design creates sectional environments in the incubator that can be controlled individually. This is the only way to guarantee homogeneous temperature in incubators containing more than 100,000 hatching eggs. Each modular section of the incubator is supported by its own temperature, heating, cooling, humidification and ventilation systems. Intensive analysis using Computational Fluid Dynamics (CFD) has demonstrated that the most effective method of exchanging energy, CO2/O2 and moisture in the incubator, is to generate as many vortices as possible – of a specific dimension and intensity – in the wake of the air pump blade. This research, combined with practical field studies, has driven the design and construction of Pas Reform's brand new Vortex. Adaptive Metabolic Feedback (AMF) has been developed to ensure that the incubation environment meets the metabolic needs of each growing embryo during its development. With a focus on managing moisture and CO2, AMF continually 'reads' the time-varying metabolism of a specific batch of embryos, to adapt control parameters and fine-tune the incubator environment according to the embryo's needs. 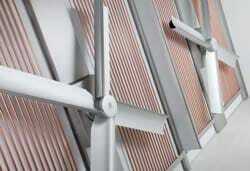 Ultimately AMF maximizes uniformity by optimising airflow, the evaporation of moisture and air redistribution. Pas Reform has combined the use of these three features in its next-generation SmartPro incubator: advanced incubation that maximizes temperature homogeneity directly, to produce the highly precise environmental controls required.